Some great news on the anthology front! The anthology, ATRUM TEMPESTAS, is now scheduled to be out February 2009...better a bit late than never (especially since many big names have been added to the line-up). I have been out hunting the wiley whitetail, so just a quick tidbit in way of an update (with more to follow very soon as events develop). 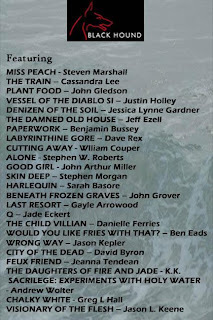 I am, as of last Friday (Nov. 7th), affiliated with and member of the The Great Lakes Association of Horror Writers. Check out our website at: www.greatlakeshorror.com and lend your support of the horror genre.